Office environments are continually evolving as we adjust and adapt to meet the demands and opportunities that technology offers. But are we meeting the needs of the modern-day worker? The ability to be ‘on-line’ and available 24/7 puts a strain on the mental and physical health of us all. Working environments, therefore, need to respond to meet this changing dynamic. The mental environment is as important as the physical environment and wellbeing is now high up on the workplace agenda. So what makes for a place of wellbeing? Designers are well practiced in putting the pieces of the physical jigsaw together to create high quality spaces. We are masters at using light, colour, ergonomics and materials to create spaces people want to be in. But we need to look beyond these physical and sensory experiences. We need to consider working practices. Admittedly this requires a receptive client and is perhaps beyond our normal remit, but the commercial realities of offices are changing. Technology has given people more options than we thought possible. Employers are having to alter contractual terms to meet the demands of the employee, who now leads the charge when it comes to how we work. What can we do as designers? We now need to be experts in knowing the market (location, technology, style), knowing the demands of the workforce, ultimately knowing our clients better than they know themselves. Every day the market makes strides in evolving trends and our industry follows. Can we predict and anticipate the next trend? Co-working is the hot trend at the moment. This relatively small part of the sector has given fresh impetus to the changing workplace. Subscription membership, hot desks, dedicated desks, team rooms – all variations on how we structure space. These spaces are popular not only for sole traders and start-ups, but give the range of environments everyone likes to work in – informal work areas, quiet work areas, presentation spaces, meeting rooms, break out, cafe. This mix of spaces allows the chance to ‘switch off’, unwind and have a change of pace. These spaces and the means to do so need to be part of the workplace offer. We must look beyond our surroundings and embrace aspects such as nutrition, exercise and fun, if we are to keep pace with the demands of today’s workforce. Only then can we hope to have well-beings. In 2017 the Crown Estate commissioned a competition for Architects to design the office of the future, utilising their building portfolio. Our proposal for the competition was for a Distributed Office environment that allows businesses to retain a fixed, leased office space while offering shared resources, spaces and facilities available on-demand. With greater physical flexibility, fixed office spaces can be smaller than required in a traditional office setup. Businesses subscribed to the proposed co-working membership scheme will be able to offer their employees access to a large network of office spaces across the city. With greater flexibility workers will be able to work more locally and maintain a desired level of wellbeing. Within each office hub, businesses will be offered a workBOX; a fixed unit to provide private space to complement the preferred operational model of each business. Each workBOX varies in size and provides traditional office space in one location or a network of private office spaces across the city, or simply a fixed storage space for businesses to spill out into larger shared working areas. The membership structure will provide co-working spaces, allowing start-ups to work alongside larger, more established companies and creating the possibility for networking and collaboration. The growth of the Knowledge Economy and developments in technology are expected to be major factors in the next shift in office working practices and design. 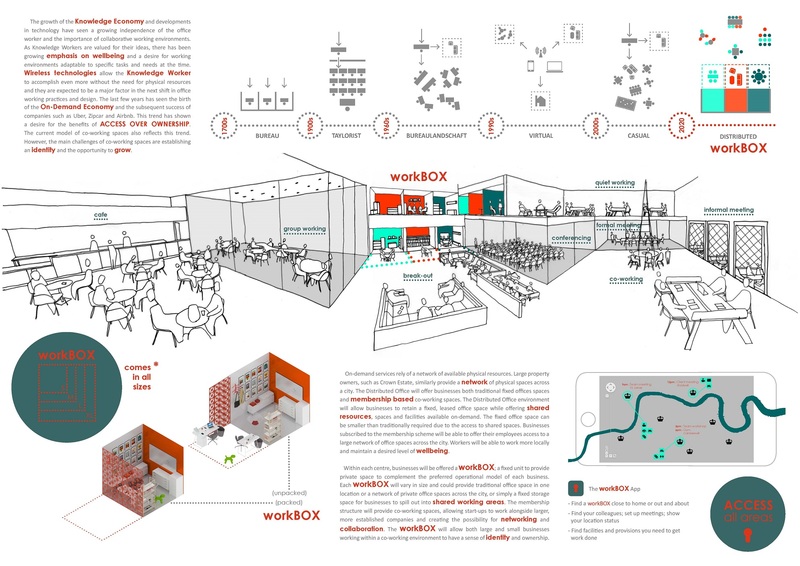 Our workBOX proposal provides a platform for the evolution of the workplace.